John Ruddy’s career CV to date reads similarly to several footballers his age. A protà©gà© at Cambridge United, Ruddy made his debut aged 17 on the final day of the 2003-4 season. After establishing himself as the U’s No. 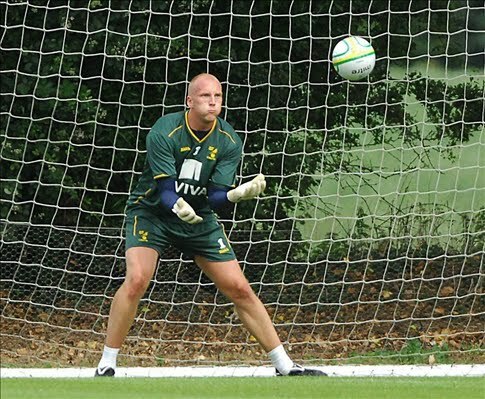 1 the following season, Ruddy was sold to Everton for an initial £250,000 (rising to £500,000 depending on appearances). Heralded at the time by Toffees manager David Moyes as a future England international, Ruddy nevertheless spent large parts of the next five years in the reserves, being farmed out to numerous lower-league clubs. Now 23, Ruddy has recently signed for Championship new boys Norwich City, taking a step down to belatedly begin his career as a permanent first-choice goalkeeper. The story of a teenage sensation bursting onto the scene at a lower-league club, going to the Premiership and being metaphorically chewed up and spat out back to whence they came is an all too familiar one. Ruddy follows the same path trodden by others, like Scott Sinclair, Harry Worley, James Jowsey and Jack Hobbs, in recent years. I first saw Ruddy play for Cambridge as an 18-year-old in the 2004/05 season, at a Fans’ United day designed to raise money for the U’s, who at the time were on their way out of the Football League and in serious financial trouble. 6ft 4, agile and domineering, Ruddy was excellent that day as Cambridge defeated Wycombe 2-1. I remember talking to various home fans, all of whom spoke about Ruddy in hushed, excited tones, lest by speaking too loudly they might ruin his fragile promise. They were all certain that Ruddy would one day be England’s Number 1. Later, our paths crossed again when Ruddy arrived at Stockport County for one of his numerous loan spells in the lower leagues. An instant hero with the supporters, Ruddy’s total concentration, athleticism and communication was a welcome change from our previous custodian, the error-prone James Spencer. His confidence inspired those around him, and supporters agreed he was the best goalkeeper Edgeley Park had seen since Wales goalkeeper Paul Jones had graced the turf a decade previously. Returning for a second spell a season later, Ruddy later followed Jim Gannon up to Motherwell, where he spent a season loan in 2009/10 and stood out as one of the Fir Park club’s best performers. Recognising that first-team football was an impossibility at Everton, Ruddy chose to move back to East Anglia and was rewarded with the No. 1 shirt for Norwich this season, for whom he has played every game so far. Consistently impressive though he has been throughout his loan spells over the last few years, it is difficult to say whether Ruddy would have benefited more from being settled at one club and playing first-team football consistently than he did by going to Everton. 23 is, after all, still relatively young for a goalkeeper, as Nigel Martyn, David James and Kevin Poole have shown. The coaching facilities at Everton would have been far superior to what Cambridge would have been able to offer, and playing in a struggling side may have affected the player’s development, as the aforementioned, once-promising James Spencer found out. On the other hand, every footballer wants to play, and going from playing first-team football every week to being fourth choice, albeit at a higher level, must have been difficult to accept. Playing only one-and-a-half seasons’ worth of first-team football, for eight different clubs over nine temporary spells during a period of five years, also must be unsettling for a young player, both on a professional and a personal level and cannot help one’s development in either respect. Debate over the new 25-man squad ruling for Premier League clubs has led to renewed accusations of big clubs ‘stockpiling’ players — taking on large numbers of young players who they know have little or no chance of becoming first-team regulars, so that they can send them out on loan to get first-team experience, increase their value and then sell them on for a substantial profit. This is not a new phenomenon — three years ago Steve Coppell complained about the same thing. The current loan system certainly doesn’t seem to have helped in this regard, and the ability to take on an unlimited number of players and farm as many out on loan as one likes seems to benefit the big clubs. If these players were released on free transfers, it might help more find regular first-team football at other clubs more quickly. This in turn might help stop the current trend whereby the England national team are good at under-age level but weaker at senior level due to the lack of English players playing regular first-team football in the Premier League. On the other hand, if young players can enjoy the top-quality coaching of the big clubs’ academies and then go and play at a local lower-league club at the weekend, this surely benefits their development? It is a difficult conundrum and one that is likely to remain an issue over the coming years. For John Ruddy, it is a case of making up for lost time as he seeks to realise the potential that both coaches and fans have spoken about for half a decade or more.